So Buffer, whose business is to drive social traffic for others, lost half of its referral traffic from social media and they are scratching their heads over it. They are refreshingly transparent about the cratering and seem unsure what has happened. But that is helpful for the rest of us. We discuss what that means for all of us using social media to drive traffic. The sands are always shifting. Also, we look at a strategy for quickly growing your Pinterest following. And Google combines machine learning with “artificial intelligence” to add RankBrain to its search algorithm. Josh wrote a post on Sitepoint sharing his struggle as a startup guy. 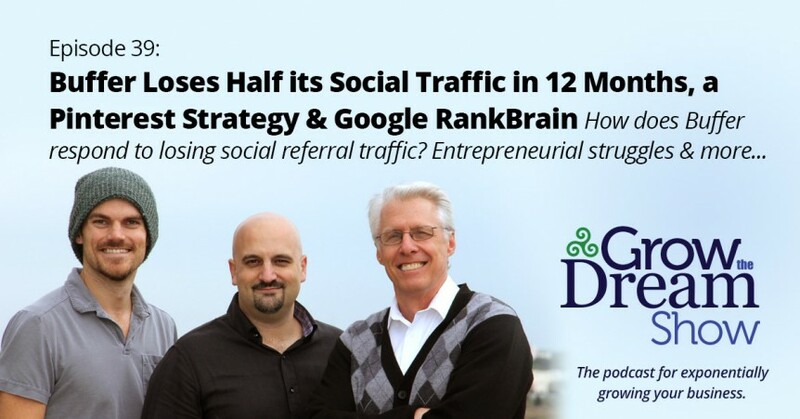 Buffer admits to losing half of its social referral traffic in the last 12 months. RankBrain, Google’s new algorithm tweak that uses Machine Learning, or Artificial Intelligence, or something. FAQs here from Danny Sullivan, who’ll be a guest on our show in 2 weeks.